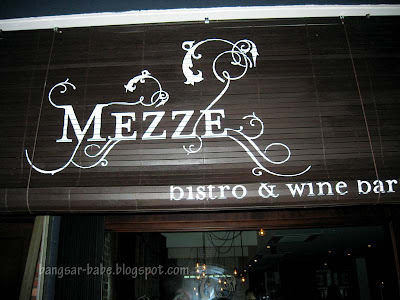 Mezze, the newest addition to the restaurants along Jalan Kasah has a lot going for it — a simple but sufficient menu, efficient service, decent prices, friendly atmosphere, and, most important, good food. The menu may only be an A3 page long, but the dishes are well chosen with appealing descriptions, making it difficult to order. An enormous blackboard hung on the wall, lists their daily specials neatly. Mediterranean food is often simple, and punctuated with plenty of fresh herbs and olive oil. 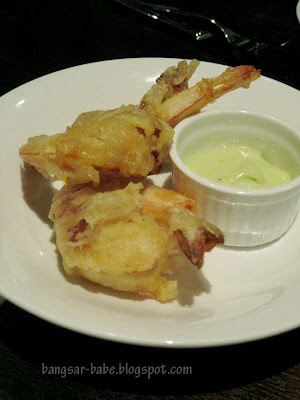 The Pancetta & Prawn Tempura (RM15.50) offered 3 large prawns, wrapped with savoury pancetta and encased in a light and crisp batter. 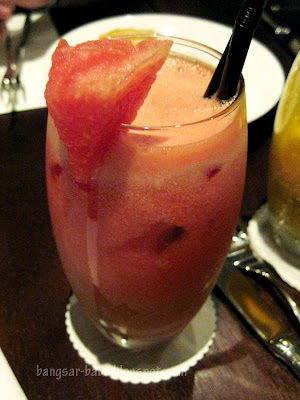 This was paired with a zingy wasabi aioli which complemented the firm and succulent prawns. I don’t see anything Mediterranean about this, but it was a pleasingly crunchy innovation. 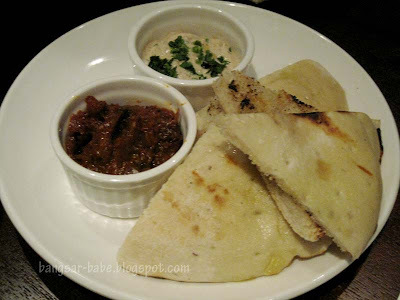 The Mezze Flat Bread & Dips (RM9.50) was a good tummy filler, but I wouldn’t say it was excellent. Between the salsa and creamy herb dip, I liked the former, which had a piquant undertone. The creamy dip was too mild, and didn’t flavour the bread very well. 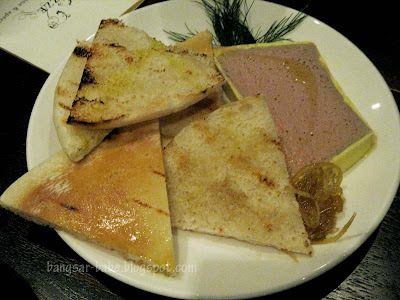 While the bread and dips didn’t knock my socks off, the Duck Liver Pate (RM13.50) did. Velvety-smooth, dense and deeply flavoured, the fennel marmalade helped offset the richness of the pate. It tasted lovely with crusty bread. 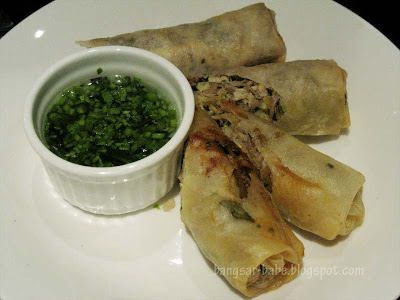 I also enjoyed the Duck & Chicken Spring Roll (RM13.50), which came with an interesting green chilli jam. Sweet and caramelised with a hint of spiciness, the jam complemented the savoury rolls well. This was very moreish, and it was hard to stop at just one piece. 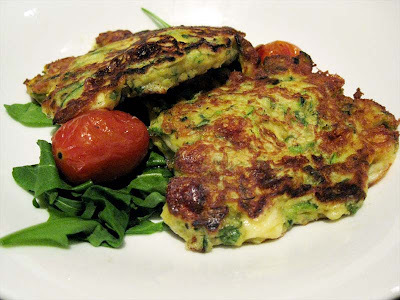 The Zucchini Fritters (RM11.50) was served on a bed of cherry tomatoes and wild rocket leaves. The fritters had a crisp surface that gave way to a spongy centre. Despite the presence of feta cheese, I found this average as the flavours were not as pronounced as I would like them to be. 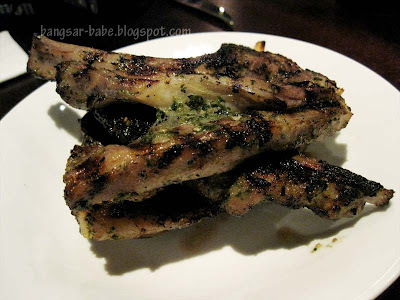 The Lamb Cutlets (RM28.00) on the other hand, were terrifically flavourful and tender to the bite. Coated with coriander mint and honey, these succulent cutlets were worth getting my hands dirty. Since there were eight of us, we ordered all the mains on the menu. Barbeque Spatchcock Chicken (RM28.00) was a humble dish of tender chicken legs, grilled, and served with Provencal potatoes and a burnt aubergine salsa. ”Spatchcock” is a British term used for chicken that is butterfly-ed before being cooked. The texture and flavour contrasts were delectable — smoky chicken, crisp-on-the-outside-nicely-done-on-the-inside potatoes and tender, nicely charred aubergine. I find lightly seasoned pasta like aglio olio bland and uninteresting, but the Chilli Shrimp Spaghetti (RM29.50) convinced me otherwise. 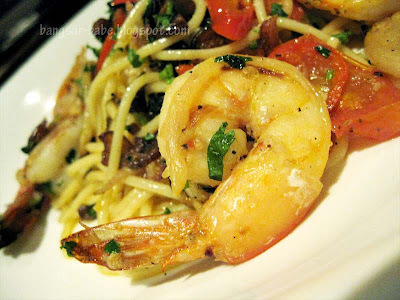 The pasta was al dente and came with huge, fresh-tasting prawns, slow roasted tomato and shallots. It was pleasing to the eyes and the clever play of herbs left me wanting more. 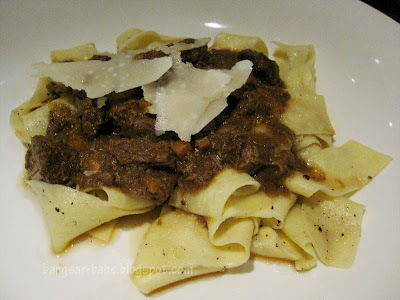 The Braised Beef Shank Pappardelle (RM32.50) boasted wide ribbons of nicely cooked pasta sauced with a luscious combination of braised beef shank. I reckon the shank was braised for hours — it was aromatic, incredibly tender and gave the pasta body. My only gripe was the imbalanced ratio of meat to pasta. The waiter didn’t ask how we liked the Rib Eye Steak (RM65.00) done, but it arrived just the way I like it –- nicely seared on the outside and a tasty pinkness in the centre. 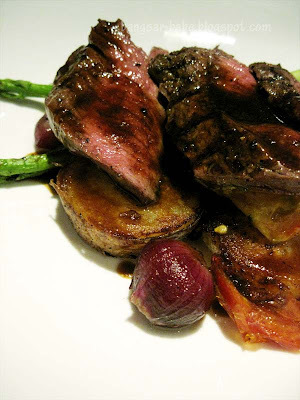 Paired with sherry beef reduction, the rib eye was tender and running with juices. I enjoyed the sautéed potatoes –- they were nicely seasoned and crisp all over. 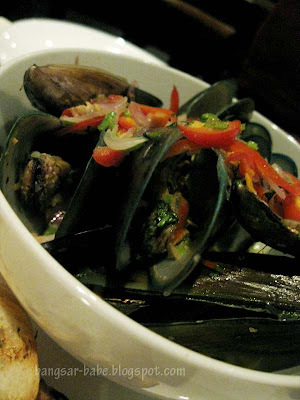 Tossed with tamarind, lemongrass, ginger, chilli and honey, the Steamed Mussels (RM22.50) smelt wonderfully fragrant. The herb-infused mussels were plump and succulent, and their natural flavours were complemented by the light but flavourful broth. 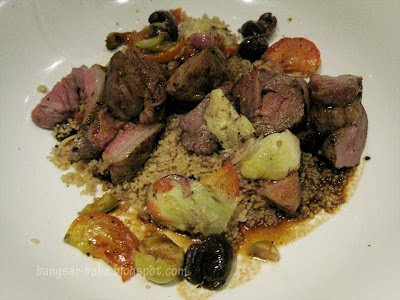 I especially enjoyed the Ballotine of Lamb (RM42.00) served on a bed of fluffy couscous. The chunky pieces of lamb were meltingly tender and flavoured with tagine spices, herbs, preserved lemon and olives. On its own, the couscous was slightly dry, but the loosely bound semolina grains absorbed the lamb juices very nicely. 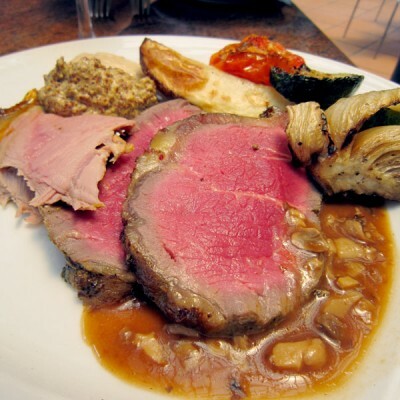 This was my favourite main course that night. 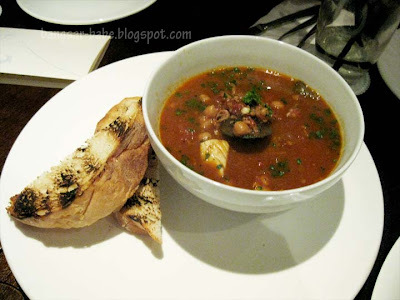 Guisado Alicante (RM28.00) was a stew-like dish filled with squid, mussels, fish, chorizo sausage, chickpeas and chilli. Redolent with spices, this vivid dish was mildly spicy, tangy and peppery. Since I like my food to be fully flavoured, I preferred this to the steamed mussels. 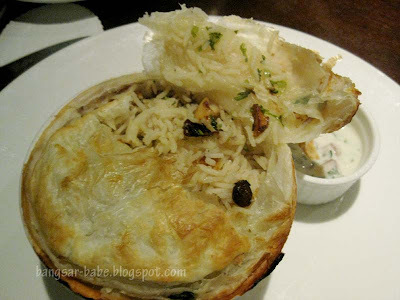 The Lamb Pilaf Pie (RM23.00) is Mezze’s rustic offering, encased in a flaky crust. I took a bite, and caught a whiff of cinnamon and bit into raisins buried amid the grains. The rice came with a side of raita, a cooling yogurt made with chopped cucumber, onions, mint and cilantro. I enjoyed the lamb, which was deeply spiced and aromatic from the cumin. While we were stuffed from the mains, that didn’t deter us from ordering dessert(s), and we ordered FIVE. 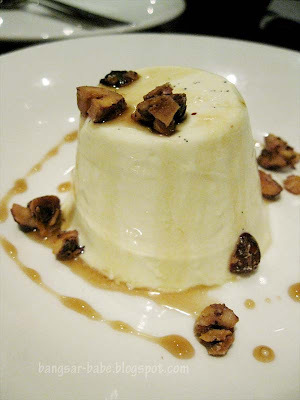 The smooth, fragrant Panna Cotta (RM9.50), topped with frangelico (hazelnut liqueur) and hazelnut syrup was elegant and not overly sweet. However, I found this a tad too creamy for my liking. 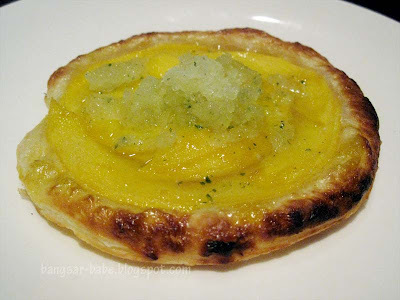 The Mango Tart (RM11.00) was nothing spectacular –- this was merely mango slices on a puff pastry base, topped with mint and pineapple granita. A bit plain, I thought. 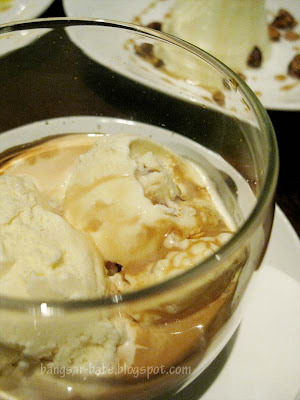 A step up from your regular ice cream, affogato (RM15.50), which means ”drowned’ in Italian, is a scoop of vanilla ice cream topped with shot of hot espresso and coffee liqueur. This espresso float would make any coffee lover ecstatic. The Brownie with valrhona chocolate (RM19.50) was alright, but I’ve had better. Mezze’s version was not as moist as I expected it to be. 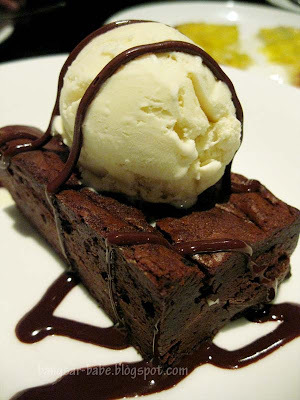 I like my brownies to be deeply chocolaty and fudgy with a cakelike crust. 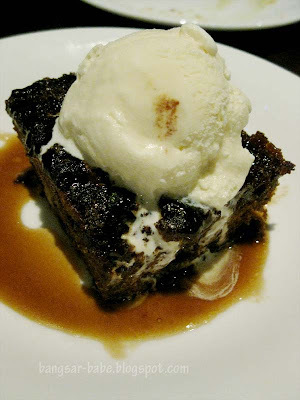 But the sticky toffee pudding (RM13.50) was outstanding –- dark, dense, and sticky, it was just the way the English make them. Draped with a buttery brown sugar sauce, it was truly luxurious with a scoop of ice cream. The pudding had a tender crust and a deep-brown caramelised flavour. I must have this simple, homely dessert again. In a recap, the food at Mezze is simple, yet elegant. This is not the kind of food that makes you quiver with joy but it makes you sigh with satisfaction. 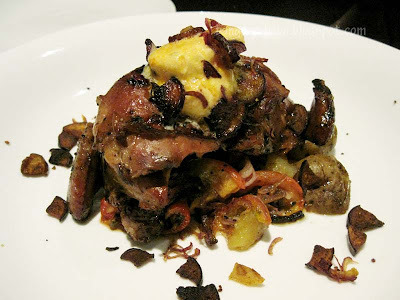 The rustic ambiance with dim lighting made my dining experience even more enjoyable. They have a pretty good wine selection, and their house wine, the Heartland Stickleback Red (RM75 per bottle/RM15 per glass) is fruity and pleasant. I had a great time that night and was more than well-fed. Thank you Jek of theQguides, Perin Petrus and Richard for your generous hospitality! Verdict: Interesting play of flavours and textures in the food. This is the place to go to for a nice, quiet meal with good wine. yes toffee sticky date pudding..the name escaped my mine totally..i just remembered the caramel and the toffee..
ooooh, nice, someone was JUST mentioning this place to me yesterday. so highly recom by ya, will hv to make a trip here soon! Lisa – Hehehe…I'd go for the toffee pudding…and affogato! FBB – It's a nice place to have dinner, and coffee after. Joe – Hahaha…I was damn full from dinner that night! looking at the food lor… haha. on the contrary, the zucchini fritters look good enough as a snack, albeit slightly bland for you? QuiRkY-Malaysia – LOL…go Mezze and get yourself one!